As a rule I rather like reading memoirs, though I must say I am picky about whose I read. I’ve read mostly literary memoirs or those about an ordinary person who had an extraordinary experience (such as Wild or The Rules of Inheritance). I don’t think I’ve ever read a memoir of a celebrity before. The phrase ‘celebrity memoir’ creates visions of cheesy covers with swily writing, with taglines promising to dish the dirt and ‘tell all’. I would never read those. But I did decide the two-volume memoir of Anjelica Huston. Partly because she isn’t some fame-hungry idiot, and also because I like her films and find her interesitng as a person; and I knew a little about her life already, so I knew it would be a good story. The memoir is split into two parts: A Story Lately Told covers her life up to about the age of twenty, and Watch Me goes from then to now. They both have beautiful covers too, which make them look like memoirs, but not like trashy memoirs. I think they are very well measured and very effective. I read A Story Lately Told while on holiday with friends in Devon, and it was the perfect way to escape while it rained and we were stuck indoors. Anjelica spent most of her childhood in Ireland, running around the family’s large house and grounds, and hearing exciting stories from her father’s overseas adventures in his career as a film director. Her father was John Huston, known for directing Hollywood classics such as ‘The African Queen’ and ‘The Misfits’ – and also as a bit of a womaniser and someone who did things his own way. 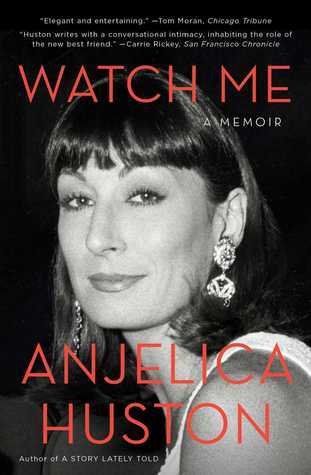 As a result Anjelica’s childhood was often punctuated with glimpses of the drama which surrounded her father, both in his professional life and personal life. He was a ‘big personality’ and their relationship, though not always harmonious, is never boring. Anjelica’s father also led her to her career as a model and actor. Anyway. 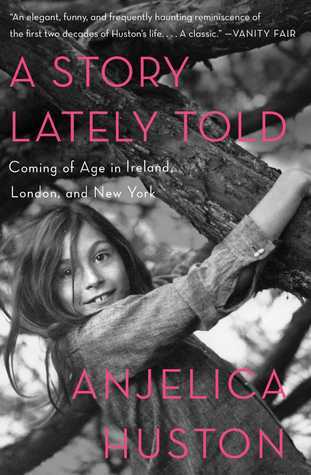 The first book is a dreamy account of an idyllic childhood in Ireland, followed by teenage adventures in London with her mother, after her parents’ divorce; then a few years in New York, and finally the beginning of Anjelica’s life in Los Angeles. It is a whirlwind of anecdotes and endless names and places, but as in both books, Anjelica Huston has a steady and calm way of narrating her story that avoids becoming too complicated or muddled, even when there is a lot going on. I found her emotionally intelligent and perceptive, with a knack for self-analysis (and analysis of others) in hindsight. This ‘knack’ also comes in very handy in the second volume, Watch Me, which chronicles her adult life. At the end of A Story Lately Told, she has just extricated herself from an emotionally turbulent relationship with the photographer Bob Richardson (father of Terry Richardson), and Watch Me begins with the aftermath of this. This relationship is brilliantly examined and explored, and Huston adds a great sense of humanity and feeling to something that happened so long ago. Likewise her account of her relationships with Jack Nicholson and Ryan O’Neal, both of whom were challenging and brilliant in their own ways. It is fascinating to hear particularly about her relationship with Jack Nicholson, and she handles the ups and downs with dignity and sensitivity. She speaks quite personally about Nicholson, but you get the impression she is still respecting his privacy, as she protects her own, and I liked this very much. She is able to tell stories without resorting to ‘telling all’. It could so easily have descended into sensationalism, but Anjelica Huston keeps it classy, as always. While Anjelica Huston’s story is filled with famous people, places, and events, she does not brag, or gossip, or sensationalise. She tells her story just as she experienced it, with its good times and bad times, just like anyone else’s life. Hers just happened to be quite exceptional. I liked her very much as I read, and very much enjoyed the style and tone of the books, which is relaxed and anecdotal, but not so chatty that there isn’t a clear storyline and structure. The books also aren’t that long, so they are not too demanding. If you have the interest, and you like memoirs of interesting women, I would really recommend these two volumes. It is a life filled with excitement and adventure (and some excellent old movie recommendations) but also with the comforting mundanity of ordinariness. This isn’t groundbreaking stuff, but it is a celebration of life and the fact that it doesn’t matter if things aren’t perfect and you aren’t perfect – life can still be wonderful. That alone makes these two books worth reading. Both volumes published in the UK by Simon & Schuster, and in the US by Scribner, in 2014 and 2015.